>i really want to see Lars and the Real Girl. i think it's interesting on how he believes that this mannequin is his girl friend. also the quote from Heath is really interesting. >Romeika, dos filmes postados, o que estou mais interessada em assistir é "Lars and the Real Girl". Acho que o filme tem uma premissa das mais diferentes e sua opinião sobre o longa é a segunda que leio que o elogia. Espero que estréie por aqui. >i thought lars and the real girl was very quirky and good too! 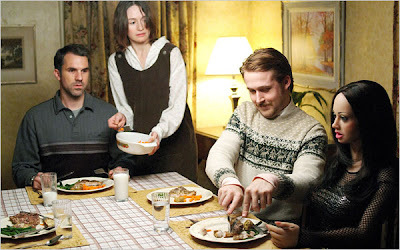 >Quero muito ver "Lars and the Real Girl", pois para mim o Ryan Gosling é um dos cinco melhores atores de atualidade e parece oferecer outro notável desempenho nesse filme. Abraço! >Ummm, I really want to see this "Lars and the Real Girl", but I fear it's destiny could be the same of "Half Nelson": unknown in Brasil!But I have hopes in seeing the brilliant Ryan Gosling in what seems to be a very original comedy.Ciao! >I've heard about Lars and the Real Girl before… I hope there's a way to find in Peru! >Romeika!Só passando para dar um oi!Mil beijos querida! >i watched LARS and looooooooved it. i loved the score/soundtrack too. do you know who did it? >Lars and the REal Girl is excellent, I never consider Gosling as a good actor but after this movie I have to watch for his future films, the films looks a little like the Wes Anderson Films and a little like P.T. Anderson (Not considering "There Will BE Blood") and a little like Max Opüls; but Gillespie's direction is great (his best at the date), maybe he can do it better for his next films (he release the same year "Mr. Woodcock" which is a extremely ordinary comedy), also, I love Emily Mortimer, since i saw her in Elizabeth back in 1998 I get in live with her.The Other film I hav not see it, maybe I give it a chance but I think that it could be a little boring.Cheers from this side of the world. >Quero muito ver Lars and the Real Girl! Parece ótimo!I love your movie reviews!!! >lars and the real girl was very funy. it's strange how you begin to care for lars, even knowing the situation is silly. but it's about caring for one another, and i think some small towns are like that. at least, i hope they are. >Kamila, se nao estrear, passa la em casa que meu irmao tem esse filme;-) Vinicius, o Gosling eh o meu favorito desses atores jovens. Tb gosto muito do Paul Dano. Abs!Copperoranges, I don't know, but I'm sure you can find some info on imdb.A.R, you saw a lot more in this film than me (PT Anderson?!?) hehe I love Emily as well, she's so great in it. >Ryan Gosling was fantastic in LATRG! He was so utterly convincing, and the plot was so bizarre but sweet at the same time. >Oi Romeika, vejo que continua vendo filmes bons, estou doido para ver esse Lars…gosto muito da Patricia e da Emily. >Oi Romeika!Tudo bem?Estou doido pra ver esse LARS AND THE REAL GIRL. Pena que não chega por aqui…O Ryan Gosling é um grande ator! Espero que ele continue fazendo bons filmes.Bjs!Bjs! >I loved Lars and the Real Girl! it was so good.